In the 1960s and early 1970s, Hugh Masekela was a long way from home in <?xml:namespace prefix = st1 ns = "urn:schemas-microsoft-com:office:smarttags" />America. Black Power Los Angeles-style was nothing like Apartheid Johanesburg—or was it? One struggle, different fronts. And, of course, the different fronts had different conditions, nevertheless, the centrality of black people struggling to create a new identity, struggling to challenge and change the status quo, all of this was very much like home to the young African man in exile. Here was a man who learned to play trumpet on a trumpet given to his school by the great Louis Armstrong. Music was his ticket to ride. Straight out of the hell that was apartheid. And to marry Mariam Makeba, one of the sweetest singers to ever come out of Africa. My man was in the midst of a cultural revolution, and in the midst of protest, riots and rebellions. Was Watts, USA, really far away from Soweto, South Africa; was Harlem that distant from Sophiatown? Listen to Hugh's early music and you will hear something, something startling, something familiar, something surprising, something enjoyable. You will hear African-American music echoed in a South African sound. You will hear the Old world origins of New world innovations. From the funk of "The Boy's Doin' It" to the hard bop of "Blues for Huey"; from the gospel of "Hush (Somebody's Calling My Name)" and the balladry of "Mamani" to the protest of "Coincidence" and the samba of "Felicidade"; from the party hilarity of "Grazing In The Grass" (which was a mega 1968 hit) and the ironic sarcasm of "A Song For Brazil" to the introspective beauty of "Where Are You Going?" and the spiritual sublimity of "Minawa," all of this fabulous music is music recorded in exile, music made years before a return home. And please check out the fabulous Letta Mbulu, multi-tracking her voice on the appropriately titled "Melodi (Sounds of Home)," consistently hitting high notes a piccolo is afraid of. Imagine the guts and the imagination it took to produce these songs. In one sense it is unbelievable—is it not a wonder how we can hold our sanity within the sanctuary of our woolly heads amid trials, tumult and indefinite alienation from all that we hold dear? I remember Brother Hugh laughing about those years. We were in Martinique attending a jazz festival and I hung out with him for an evening. You should have seen him talk about how physically fit they were while living in Los Angeles. Hugh said that one of the recording executives even commented on it. Then Hugh laughed his hearty South African chortle: "They didn't know we were so poor we couldn't afford any transport. We rode our bicycles everywhere—that's why we were in such good shape." You can not fully understand the joke if you've never been to Los Angeles where everything is so spread out, you need to drive a car to get to the corner store! But hasn't humor always been one of the secret (or really not-so-secret) ingredients in our survival kit? Hugh's music has that deep humor in spades, running in parallel to the even deeper seriousness: the freedom ideals, the struggle encouragement, the, shall we say, mad and maddening coincidences of life. I will never erase my internal recording of Hugh's eyes as he said what it felt like to be in exile in New York City and one day run across a man in Central Park, a black man who turned out to be South African and the overwhelming joy Hugh felt as he and that brother-stranger talked in their mother tongue; how important it was to speak those birth syllables of Xhosa after so long being tongue-tied by alien English. I have always loved the way Hugh sings. Full out, bellowing, shouting, cussing, laughing, 100% invested in the sounds his voice makes regardless of whether it is pretty or in tune in a western sense. I have always believed that African music was and remains the African-American mother tongue. Music is our address, where we live, how to reach us, especially in a strange and alienating land. But music was also our firmament, our line of defense and, in sometimes subtle, sometimes strange ways, also our weapon and escape vehicle. Every step of the way, Hugh was challenging the system. Music—the force of his personality personified in song and flugelhorn, confronting stereotypes. No jungle bunny, he challenged what they saw when they looked at him, what they heard when they listened to him. All of his music had a deepness that was captivating. Credit must be given to Hugh's expertise as a jazz musician. But then again equal credit must be given to Hugh's fearless deployment of his African roots. When Hugh did The Boy's Doin' It album it was a pan-African effort that employed Ghanaian musicians while most of his other recordings had been with fellow exiles and American musicians. This was early, early examples of what we have come to call world music. And beyond recording, he started a record label, Chisa; worked out a distribution deal with Motown, attempting to seize the means of production. Too many of us are unaware of all that we have been. We think fighting to get ahead, to own and to control is something new, something recently thought of. Not so. Much of this music is available to us today because Hugh owns rights—give thanks. On the artistic scale, the pinnacle of all of Hugh's early catalogue is his jazz album Home Is Where The Music Is. The title alone is a philosophical statement of the highest order, a statement intuitively, if not consciously, embraced by African-American and Black culture all around the world. 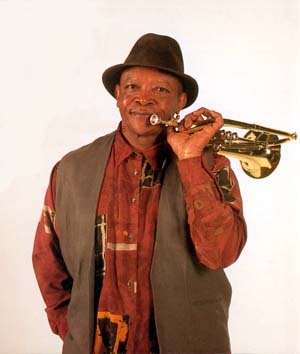 The band is composed of three South Africans (Hugh Masekela – trumpet; Dudu Pukwana – alto; Makhaya Ntshoko) and two Americans (Eddie Gomez – bass and Larry Willis – piano). This 1972 recording is an accurate reflection of the time and one of the best jazz albums from that era. Although it is not well known, when people do hear it, invariably, they are knocked out by the exhilarating excellence of the music. The repertoire moves from moments of soft shinning subtlety to all out, surging, no holds barred passionate playing. At the end of the drum solo on "Blues for Huey," you can hear one of the band members shout out: call an ambulance! This mixtape is a homage to the early years of a musical hero. There is more to come—Hugh is still making beautiful music. And we will get to all of that in due time but for now let us pause and reflect. Let us journey back in time. Here are some artifacts from those long gone years. These are not mere curios to be gawked at momentarily and then forgotten. This is a sinew holding together our souls. These sounds are moments you may not remember but once you hear them, whether now for the first time or for the first time in a long time, these sounds are songs that should reside forever in the home of your heart. "I think that any artist that comes from an oppressed community and doesn't sing or talk about it needs his head examined. Now, I wasn't making music because of oppression; I was making music because I loved it and it's all I've ever done. The fact that I came from a country with oppressed people was just a coincidence. Had I been a garbage man, I would have been just as militant." "Bajabula Bonke (The Healing Song)"
"Hush (Somebody's Calling My Name)"